Ironbark Citrus was established in 1990 by Susan and Allen Jenkin. Located in Mundubbera, Queensland, the orchard spans over four farms and consists of over 88,000 trees. Ironbark Citrus currently grow several varieties of Mandarins, producing more than 5,000 tonnes of premium quality fruit each year. Susan and Allen manage and oversee all areas of production and pride themselves on producing the best quality product for supply to Australia and export around the world. 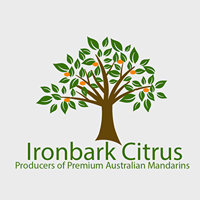 Ironbark Citrus are export specialists, and have been successfully exporting mandarins for over 20 years to countries such as Indonesia, China, Taiwan, Thailand, Middle East, Vietnam, Malaysia, Singapore and the Pacific. Harvesting starts week 4 in April and continues through until week 1 in September. All orders are packed to individual customer specifications, either pattern pack or tumble fill into cartons with a nett weight of 9kg, 10kg, 16kg or 18kg. You tell us what you want, and we can do it! When buying an Ironbark Citrus Mandarin you find that good flavour and colour, smooth skin, great nutrition, and most of all, freshness, are our priority and our promise.